The RC4WD 1/18 Gelande II RTR offers the versatility and advanced design needed to deliver true 1/18 scale performance. Packed full of capability, the Gelande II is ready for challenging terrain and is built with quality materials and craftsmanship. It can maneuver extreme descents and climbs with ease, is built for the true off-road enthusiast. The core of the Gelande II is the redesigned R5 1/18 Mini Transmission V2 that delivers power to the 1/18 Yota II Axles. This chassis delivers on performance and looks to match the drivers identity. The Gelande II features double triangulated 4 Link Front and Rear Suspension, with a chassis mounted servo for a more scale appearance. This 1/18 Gelande II features the Defender D90 Body Set with an awesome assortment of scale details including chrome decals for the mirrors, door handles, vents and detailed grille. The Defender D90 body brings new meaning to scale realism. The body is painted blue and white for a simple, but impressive look - plus it features a full detailed interior including a steering wheel, seats, gear shifter, handbrake and a detailed dashboard. It's all here to bring your build to next level. From emergency and expedition vehicles, down and dirty off-road rigs and even daily drivers, the G2 can be customized to pull off any look you choose. Are you ready for a totally unique off-road experience? 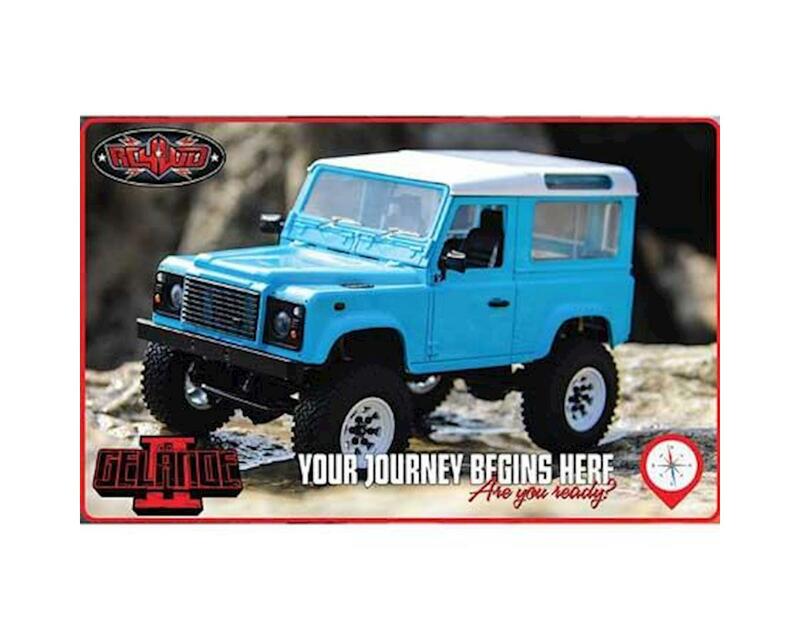 Put your off-road driving to the test and see why the Gelande II is unmatched in its class! NOTE: This is the updated Gelande II 1/18 RTR, with updated ESC/Receiver system, 2S LiPo battery with balance connector and USB charger. Nothing! Everything you need to get on the trails is in the box! Fun little truck! Great for trailing around the house or outside in the backyard/flowerbed. Weak point is the motor as it burnt out relatively quickly. RC4WD was good about sending me a replacement.